"one of the most original, clever, and terrifying books to be published in the 21st century." 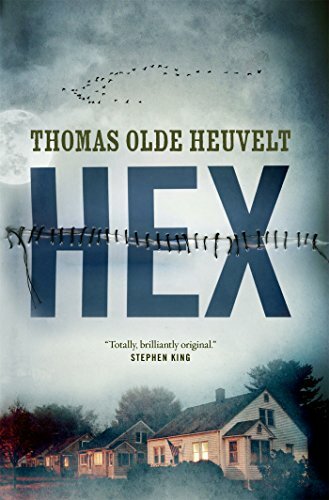 Horror readers across the globe will soon revere Hugo Award-winning author Thomas Olde Heuvelt for his new novel Hex, one of the most original, clever, and terrifying books to be published in the 21st century. Hex is the tale of the contemporary residents of Black Spring, a small town nestled in the Hudson Valley, much like any other, with one exception: It has lived under a curse for the past three hundred years. The specter of the Black Rock Witch, aka Katherine Van Wyler, a woman tried and executed for witchcraft in the 17th century, haunts the town, materializing at random in the forest, the streets, and even inside people’s homes. Despite her frightful appearance (her arms shackled by chains and her eyes and mouth sewn shut), Katherine’s appearances are as common an occurrence in Black Spring as rain in a humid climate. All the residents are quite used to seeing her and usually resort to closing doors or throwing dishcloths over her head when she appears. The word cursed applies to more than Katherine’s haunting, however: her eyes and mouth are sewn shut for a reason—given the chance, her spells could easily bring doom. And if anybody tries to leave the town, they are immediately struck with a swiftly deepening sorrow that inevitably leads to suicide. The whole town has grown and flourished around this curse. Elders and council members have formed a security organization known as HEX to monitor Katherine’s appearances, and to keep visitors from “Outside” away, often putting up fronts of heavy construction work to deter curious folks seeking new homes in Black Spring. For the sake of the curse, nobody gets in . . . and nobody gets out. So it is that a group of teenagers, getting sick and tired of growing up in such an isolated residence, think the witch isn’t as much of a threat as she seems to be and that she deserves nothing more than humiliation. And although they think they’re safely playing with fire, it’s only a matter of time before it catches—and burns. What works so well about this book is its face-value setting. The reader is dropped literally into the middle of Black Spring as the residents go about their day, working, going to school, eating, exercising, listening to music . . . oh, and Katherine Van Wyler just appeared in somebody’s living room? No problem; they’ll just report it back to HEX on the HEXApp on their smartphones. This matter-of-fact setting creates an almost alternate history/dystopian feel to the novel: a very modern American town is living under quarantine due to an ancient curse. Make no mistake about the nature of this tale, however: It is absolutely terrifying, and Olde Heuvelt delivers on all of its horrific promise, leading to a climax that’s darker and denser than a black hole. Hex draws upon many classic elements of the small-town horror trope, with cliques, secrets, and rumors lurking behind closed doors and facades of peace and harmony. What makes this setup work so well in this case, however, is the almost postmodern awareness of the characters to their plight and how much of an everyday existence this is for them. Similarly, Katherine Van Wyler is not portrayed as a villain in any kind of usual sense. Because everybody in town is used to seeing her, she serves as more of a constant background threat, like a potential wildfire in a dry climate. This relegation of her presence is almost deceiving, both for the reader and for the characters—she’s still creepy as hell, and she is still an extremely powerful presence that has to be given respectful distance by the townsfolk. The Grants, a family of four, serve as the emotional core to the story, with all-too-believable (but not melodramatic) tension at work between them. There’s Robert Grim, the head of the HEX security team, for whom work never ends. There’s Griselda Holst, the unhappy town butcher, whose signature pâté dish is almost a character unto itself. And then there’s Katherine Van Wyler herself—who, despite being a source of neverending tension, is so subtly illustrated that her own persona creeps up on the reader, revealing a person every bit as nuanced and flawed as the populace that fears her. The background of the novel’s publication is a fascinating tale unto itself. Originally published in the author’s native Dutch in 2013, it was later sold for English publication on either side of the Atlantic. Although translator Nancy Forest-Flier had a hand in this, the multilingual Olde Heuvelt saw a chance to make a whole new spin on the novel, deftly transplanting it to the U.S. with such conviction that it comes across as if it had always been an American tale. And perhaps even more noteworthy is the overall direction of the story. Although he retained most of the original Dutch novel, Olde Heuvelt wrote the last several chapters exclusively for this new English version, in English. Utterly brilliant and grimly executed, HEX is a wild tale that’s as clever as it is terrifying, and is a definitive horror novel of the 21st century. Just know that long after you close its pages, a part of you will be left behind in Black Spring, with the specter of Katherine Van Wyler lurking beside you.